Jimmy at Home, from the series "Small Town Inertia"
For the last 18 months together with people on or far beyond the outskirts of my local Market Towns community I have been recording through collaborative environmental portraiture, audio and video interviews coupled with straight documentary shoots their life stories and memories, musings, hopes and struggles. I do this with a passion and belief that the photographs we can make have a weight and longevity beyond our time here, have an ability to communicate a story long after the characters have departed, they are time capsules awaiting discovery. These are moments of daily endurance that in a generation will have passed forever. I work as a full time Carer in my families home and at the end of the week there is little budget for any photographic work. Up until 3 months ago all my equipment was borrowed and all of my shoots are completed in free time away from my duties at home. 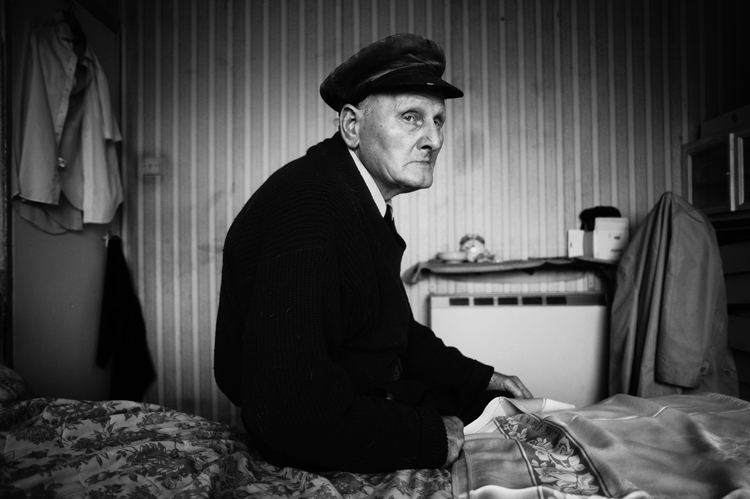 Portraits from the Small Town Inertia series are multi-award winning and have been published in print and book format worldwide. Small Town Inertia has no end date, it's a project I will work on forever, constantly updating how I present the stories via essays, interviews, articles, stories, portraits, mixed media exhibitions and a series of books.